Atheneum/Richard Jackson Books, 9781416950462, 48pp. 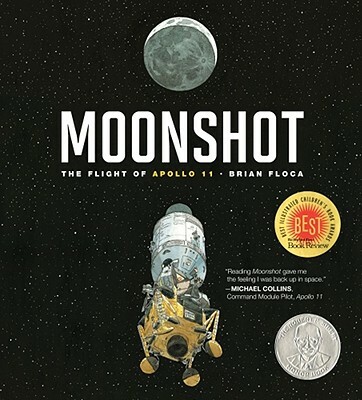 Look for the newly expanded edition of Moonshot, coming in to orbit on April 9th, 2019! Brian Floca explores Apollo 11’s famed moon landing with this beautifully illustrated picture book! Simply told, grandly shown, here is the flight of Apollo 11. Here for a new generation of readers and explorers are the steady astronauts, clicking themselves into gloves and helmets, strapping themselves into sideways seats. Here are their great machines in all their detail and monumentality, the ROAR of rockets, and the silence of the Moon. Here is a story of adventure and discovery—a story of leaving and returning during the summer of 1969, and a story of home, seen whole, from far away.